"This Spinach and Cheese Pasta has become a regular family dinner in our home," says Giora Shimoni, who points out that it's easy and quick to prepare -- and delicious. To bump up the visual interest and flavor, Shimoni sometimes sautes a red bell pepper along with the spinach. And if you want to make this dish even heartier, toss in some of your favorite roasted vegetables and chickpeas for a colorful, satisfying one-dish meal. If you're having trouble tracking down Bulgarit, an Israeli take on the Bulgarian feta-style cheese known as sirene, opt for a sheeps' milk feta. The award-winning Pastures of Eden is a good choice. The OU-kosher certified Israeli feta is available at kosher supermarkets, and many Trader Joe's stores. Want to cut down on the prep time? Use baby spinach, and eliminate the need to remove stems or chop leaves. Bring a large stockpot of water to a boil. Stir in the pasta and cook according to package directions until al dente. Transfer the pasta to a large serving bowl. While the pasta is cooking, warm the oil in large chef's pan set over medium-high heat. Add the garlic and sauté until fragrant, about one minute. Add the spinach and sauté until the leaves wilt, about three to five minutes. 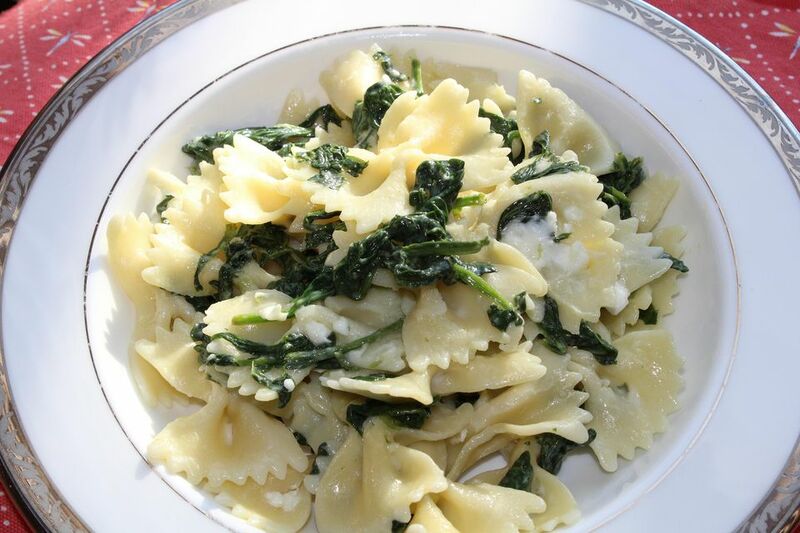 Add the wilted spinach and the cheese to the hot pasta and toss to combine. Season to taste with the pepper if desired.